Use our quick and simple form to apply online. iSmart Consumer Solutions no longer process Free Checks, filling out the form below will engage out sister company 3DM Legal Limited for your Free Check. How do I know that I have been mis-sold PPI? It can often be difficult to determine whether or not you have been mis-sold PPI. This is due to the fact that there is more than one way for PPI to have been mis-sold. Any of the following conditions can warrant the insurance as mis-sold, enabling you to claim it back. One of the more common causes of mis-selling is where PPI was sold to you without your knowledge or consent. It was often billed as a compulsory part of the loan and you may not have even been aware of it's inclusion when taking the original loan. It will usually show up in the fine print of your agreement and any bills as an additional expense. Even if you were aware of the policy, the Terms & Conditions of specific PPI products might have excluded you from the insurance. For instance, many PPI policies are unavailable for people of certain circumstances. This can relate to financial situations, such as being a pensioner or unemployed, or based on other factors such as medical conditions. In these cases, PPI may have been completely irrelevant because you were not able to benefit from it. If you were mis-informed about what PPI covered and whether you were eligible for the cover then you also have grounds for a compensation claim for mis-selling. If you feel you have been mis-sold PPI then please consider a Free Check to see what policies you have before making a claim. Further factors that determine whether PPI was mis-sold include the duration of the insurance compared to the length of the loan. Many policies simply didn't last as long as the repayment schedule and this meant the policy provided insufficient cover, classifying it as mis-sold. How easy is it to use iSmart Solutions? A Free Check request can be made online in a simple and relatively quick online application or via the UK call centre where your details will be processed and a Free Check pack will be sent to your address. 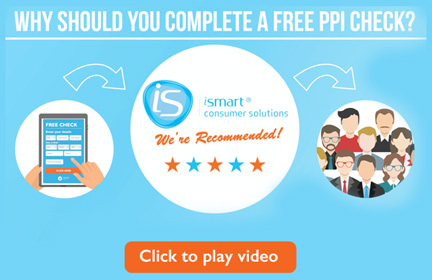 What do you know about PPI?